It is fall, and fall means football. Even if you take issue with the NFL’s mounting number of off-the-field controversies, you likely are, or at least know, someone who has a strong allegiance to a college team (and, as someone who grew up in Kentucky, which has no pro team, I can relate to college football being the main football-viewing experience). Either way, watching football means salty snacks, and you’re going to need something to drink. Bubbly wine is the match you want. Beer, of course, is the classic football–viewing beverage, so it makes sense that classic football snacks — pretzels, nachos, wings, pigs in a blanket — go well with a bottle of Budweiser, which helps wash away the food’s salty, often-fried carbiness and fat. These are the exact same attributes that make the food great for sparkling wine. 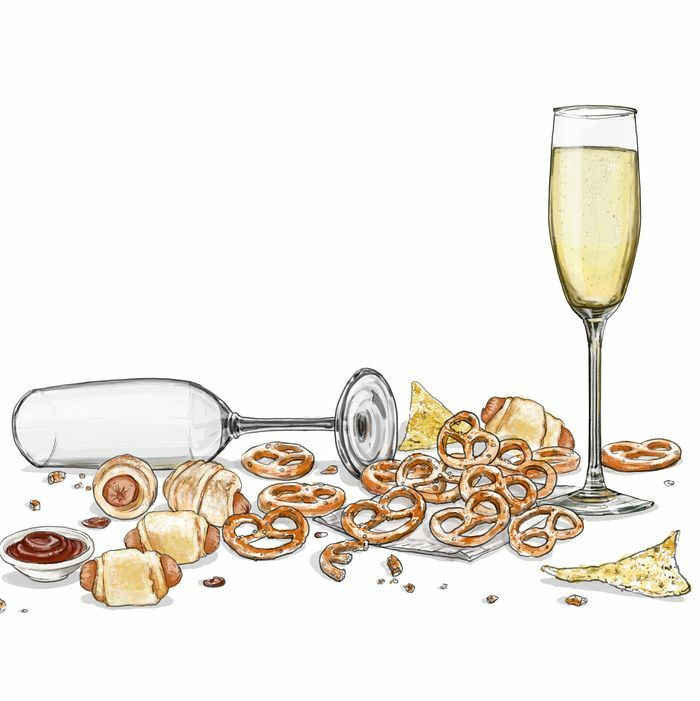 Furthermore, all the bready qualities of the food will align with the natural yeastiness of sparkling wine — it’s the same reason that Champagne and fried chicken are such a great pair — for a classic “like with like”–style match. The wine also has an added bonus over beer: Sparkling wine provides some acidity that will help brighten things up. But which wine to grab? Well, when we talk about football, we’re talking about America, and it just so happens that every state in the U.S. produces at least wine. (Even the states you would never guess, like Hawaii or maybe Idaho.) Quality can vary — a lot — from state to state, but at least some unexpected places make stupidly good sparkling wines. This is the wine you’ll want to drink next weekend, and really any day you can. The beauty of these wines, at least at the more affordable end of the spectrum, is that they’re such easy drinking that you can open them anytime you want. Gruet took the Western U.S. market by storm and has slowly made its way East. You can find these surprisingly affordable bottles in more places than you might expect. The bigger surprise: It is an excellent wine in this price range that might remind you of really good Cava, with riper citrus and textural richness. Northern New York has a lot to offer for cool-weather wines and sparkling is no exception. This rendition is 58 percent Chardonnay, 42 percent Pinot Noir, and will be round and decadent with enough lift to carry you through the game, even with overtime. Yes, the price is comparable to great Champagne, but you’ll impress your wine friends more if you manage to track down this bottle, which is something of a unicorn. Even the shops that do get some, don’t get many. But Tony Soter — the man after whom the vineyards are named — has almost 40 years of top-quality wine experience, and biodynamic farming gives these particular wines a vibrancy that you will definitely notice.